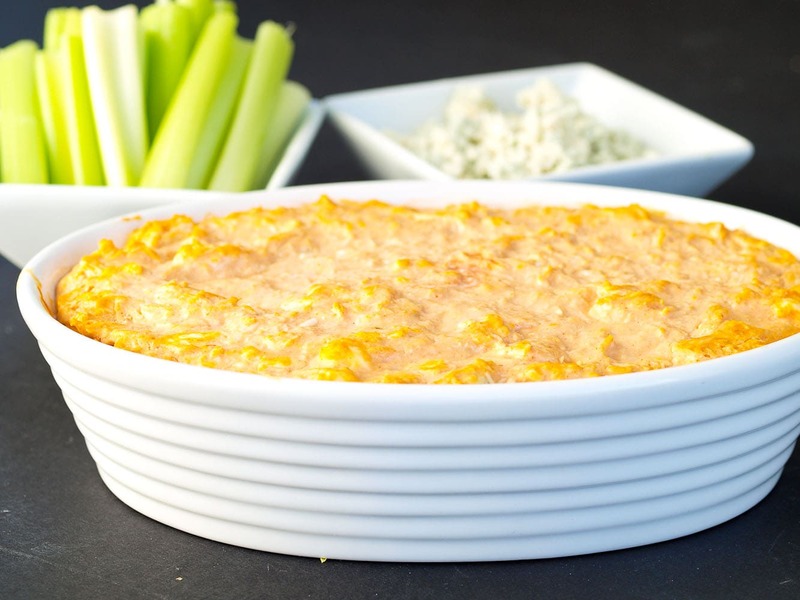 This Skinny Buffalo Chicken Dip recipe lightens up your favorite appetizer without sacrificing flavor! Whenever you go to a party, do you notice which appetizers are the most popular? I wasn’t sure if that was just a food blogger thing or if everyone notices. Well, anytime Buffalo Chicken Dip is in the lineup, it’s the first one to go. Everyone goes crazy for this stuff. Because it’s so addicting, I decided to create a Skinny Buffalo Chicken Dip. Might as well save a few calories at our next party, right? I made a few easy swaps and even though the calorie and fat count are lower than regular Buffalo Chicken Dip, the flavor is not. 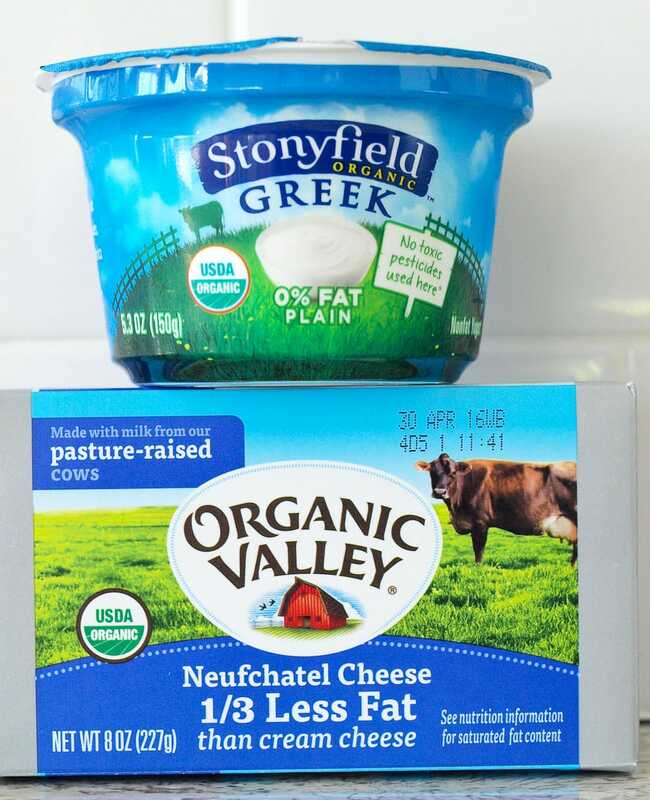 Instead of regular full-fat cream cheese, I used Neufchatel cheese. It acts just like cream cheese, but generally has 1/3 the calories and fat. You can find it right next to the cream cheese at most grocery stores. Then, instead of a bottled salad dressing, I used nonfat plain Greek yogurt. This appetizer is super easy to throw together, especially if you already have some shredded chicken on hand. Just mix the five ingredients together and bake in the oven! Because I think every Buffalo Chicken Dip recipe should have bleu cheese flavor shining through, I didn’t skimp on the bleu cheese. If you are one of those people who used ranch dressing (who are you?!) instead of bleu cheese, you can use less bleu cheese or sub in a different cheese altogether. 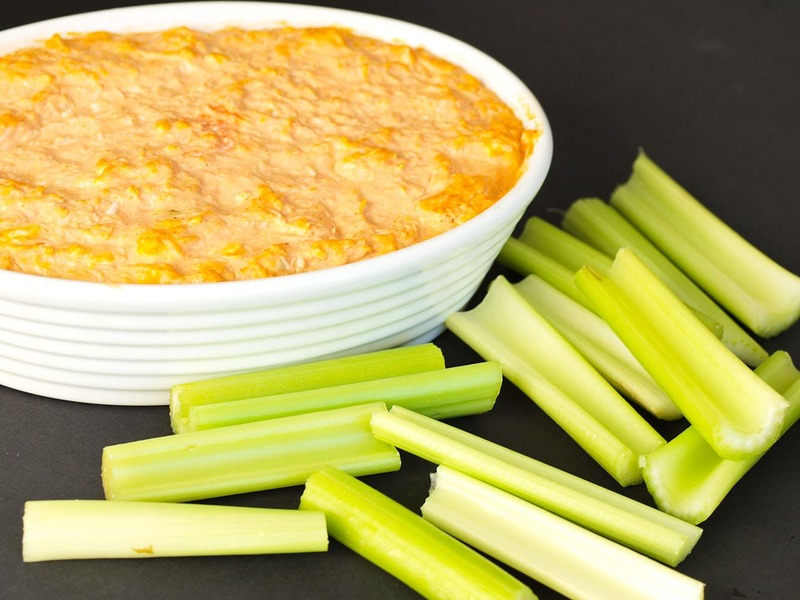 So just how skinny is this Skinny Buffalo Chicken Dip? I calculated the calorie and fat content of a few recipes for the regular variety, and they came in around 170 calories and 14 grams of fat per serving. This skinny version has 108 calories and 8 grams of fat per serving. All without sacrificing any flavor! 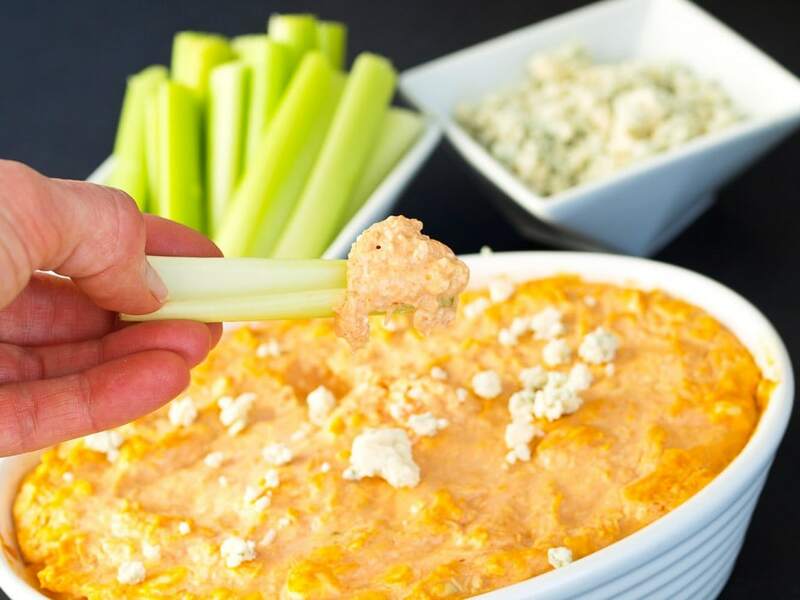 Trust me, this dip is just as addicting as any other Buffalo Chicken Dip appetizer you’ll come across. Also, new feature alert! Look below the recipe for the full nutrition label. 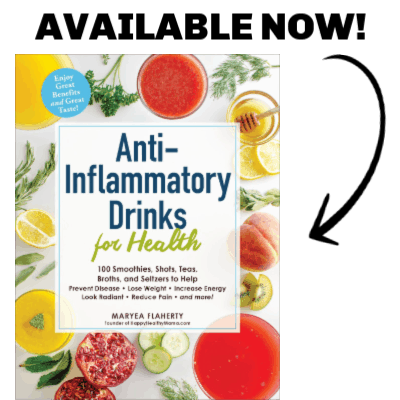 I am going to try to update as many old recipe as I can, but going forward I will provide nutritional information for my recipes. I get the questions enough that I’m glad I can finally provide this to you! Ready to dig in?! If you have a Super Bowl party you’re throwing or attending, make sure you save this recipe. 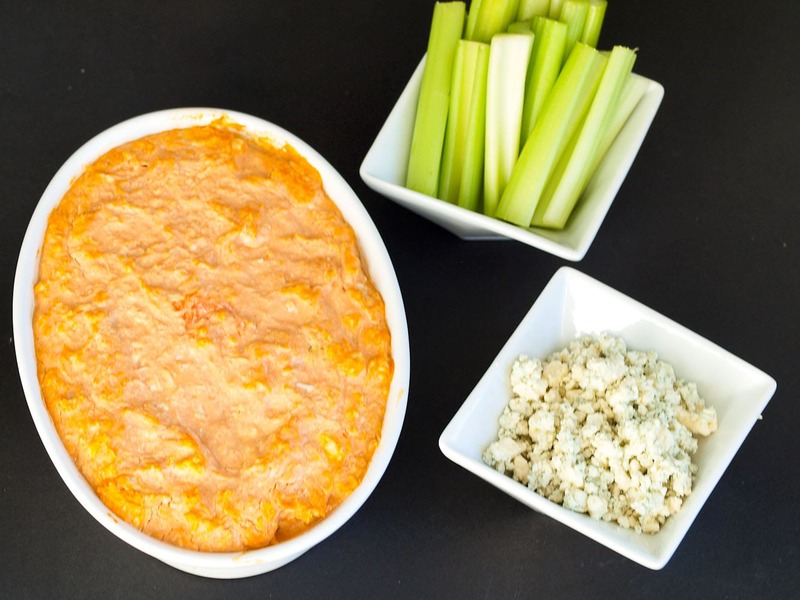 This Skinny Buffalo Chicken Dip is a lighter version of your favorite appetizer! I’d totally be devouring this at a party! You would not be alone! It makes 16 servings and they are about 1/4 cup each. I hope you love this! Do you think I could put this in a crock pot? It is for a work lunch and I won’t have access to an oven to bake it right before lunch. Yes I think that would work fine! I’d do it for a couple of hours on high or if longer on low. There is an add directly over the recipe!!!! Get your page together! While I appreciate you letting me know that you were unable to see the recipe due to an ad, I really don’t think yelling at me is necessary. I put a lot of time and effort into this page, not to mention the expense of running a blog. The ads I have on my page are what make it possible for me to provide free content to anyone who is searching for it. I apologize that the ad covered the recipe. I will be sure to let my ad network know about the glitch. Thank you for your hard work. I know it takes time and dedication to keep a FREE BLOG running ☺I will be trying the healthy version of this dip!!! Even tho the add is over some of the recipe, I think that the entire recipe is shown I would love to try this recipe please correct me if I am wrong and let me know which ingredient you cannot see but to me it looks like the complete recipe thanks for all your recipes that great.And if someone gets their wires twisted because of the ad over the recipe let them start posting some recipes perfectly. 5⭐️⭐️⭐️⭐️⭐️Great recipe! Thx for sharing your hard work w us. ???? This is delicious. Will be a go to appetizer for me. Making this for Sunday Football Fun Day! Haven’t baked it yet but tasted the “everything-mix” and I already know it’s gonna be a hit. What serving size are you basing your nutrition facts off of? I count macros and just need it to do some math. 🙂 Thanks! The serving size is 1/4 cup. How much is a serving size? Thank you! Can’t wait to try it! The serving size is approximately 1/4 cup. Do you use 4 oz or 1 cup of blue cheese? Thanks!! The weight of the blue cheese crumbles is 4 ounces, but it fills up about 1 cup. This is definitely one of my favorite appetizers at parties! Question though – I’m not a fan of blue cheese, and I don’t think I’ve ever eaten a buffalo dip with it in there. Can that be substituted with something else? You can use cheddar or monterey Jack cheese! I’ll be making this for the Super Bowl! Looks delicious! Silly question, is an 8 x 8 dish big enough? That’s not a silly question! 🙂 Yes, that size should work fine.